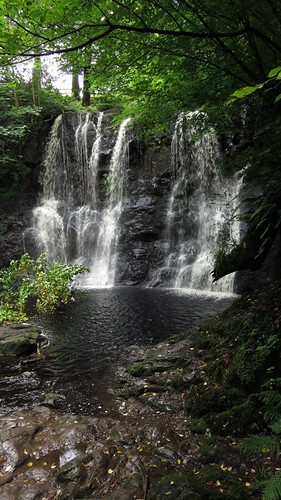 Exploring a few of the Nine Glens of Antrim: Dark Hedges—Glenaan with its heather bog—Glenballyemon—Glenariff with ‘Waterfall Walk’ and scones—Ballymoney and Dunlop Memorial Gardens—An archeological mound. 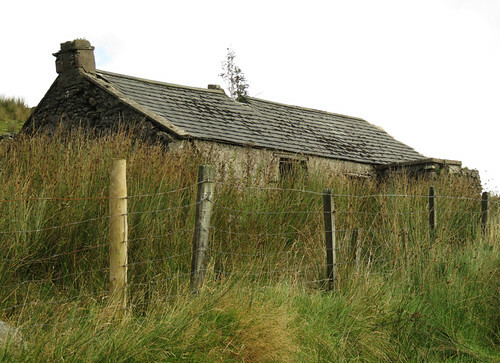 Today we decided to go for a ‘Scenic Tour’ of the Nine Glens of Antrim (dotted lines on the map) and promptly got lost. Some serious squabbling ensued. It was apparently my fault as I had totally failed to live up to Al’s idea of a navigator. I, of course, was trying to lay the blame on Al —after all, it was his decision not to use the GPS. Several more wrong turns later, we were out of the car looking around and squabbling again. This time, a van stopped and interrupted our squabbling to ask us if we wanted to go to Dark Hedges (#11 on the map above). Apparently EVERYONE gets lost trying to find it. 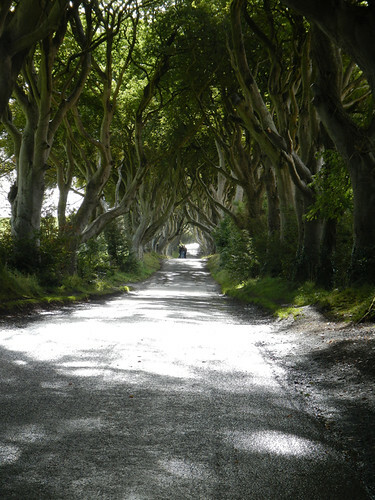 This is Dark Hedges in the Antrim Glens, recently famous for being featured in the Game of Thrones. Unfortunately a huge white camper van was parked in full sight at one end of the tree tunnel, while its owners hung around in the middle of the road playing ring-around-the-rosy and taking dozens of selfies, thus guaranteeing that either they or their van was in every single photo. Three-quarters of an hour later they finally left, going up and down the road with the video camera running. But by that time so many tourists had finally found the place and parked their unphotogenic cars on either side of the white van it was a circus. So this is the best shot we got. 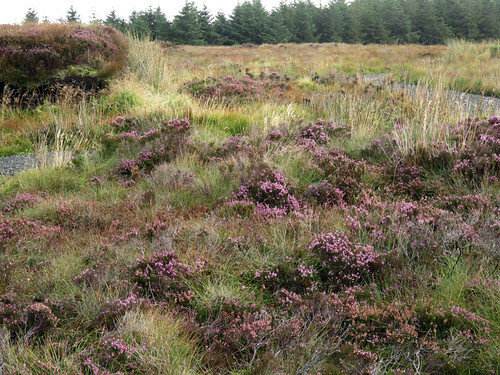 From there we used the GPS to find our way to Glenaan and passed this heather-filled bog. 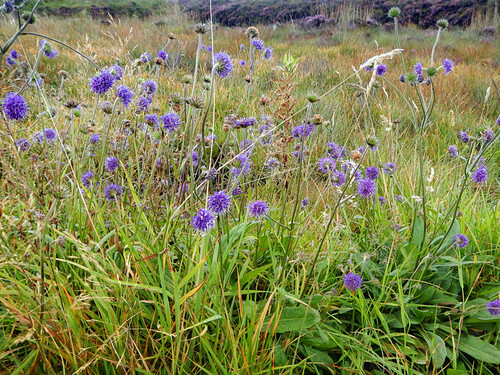 Wild flowers in the bog. A pool by the bog. 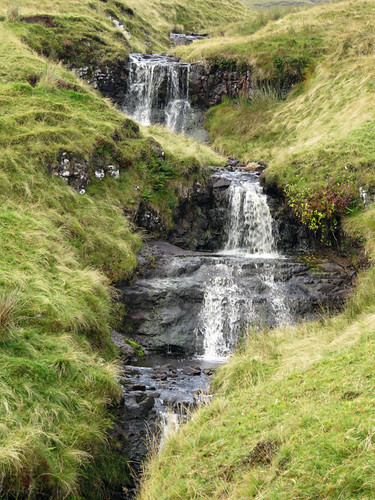 And cascades of waterfalls from small streams along the road. 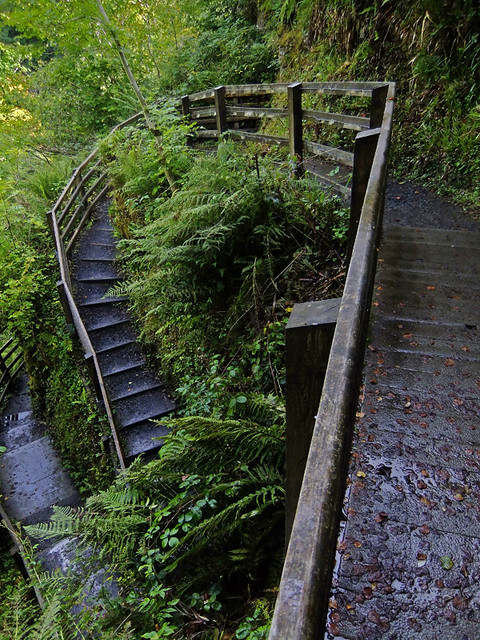 We were really looking for #13 on the map with its Waterfall Walk, and eventually we found it. There was a small restaurant with a waterfall almost directly behind it. 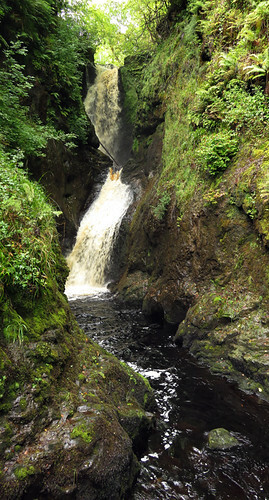 But the photo on the back of the map promised a rather magnificent-looking waterfall and this wasn’t it. 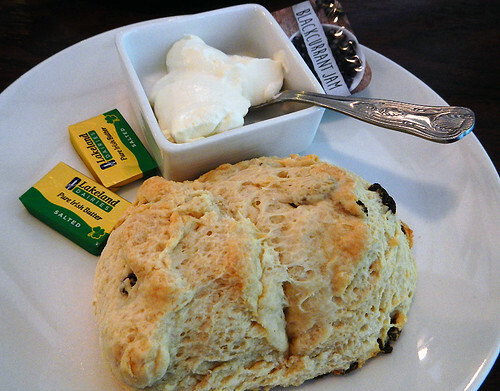 Stopping in at the restaurant to ask directions to the larger falls I was distracted by coffee and scones with black current jam and clotted cream. 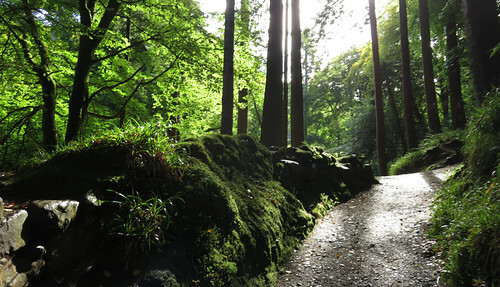 After a lovely unexpected break, the server gave us the directions and we set off on a sun-lit trail. Up and down hill and dale. This is the ‘right’ waterfall! 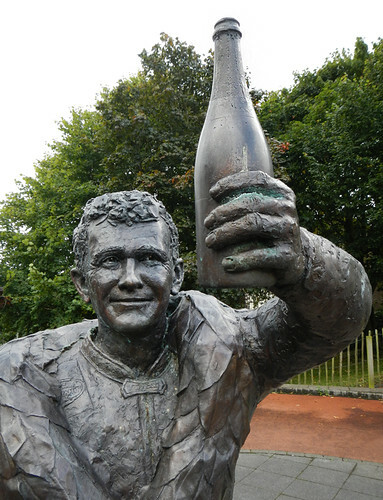 Dunlop Memorial Garden in Ballymoney (#12) was also marked as a highlight but it was tiny. Next on our map route was #4, an archeological site, but we had a lot of trouble locating it. I went into several different stores to ask but nobody in the area had even heard of it. Finally I found a butcher who described it as “nothing but a mound – it could be anything.” So that was that and from there it was back to the coast for Dunluce Castle ruins and White Rocks Beach. More of the Daily Post’s Weekly Photo Challenge: The Road Taken. Al was being especially difficult, moaning about driving stick and on the wrong side of the road, and he really expected me to stop taking photos and watch for road signs — Pishtosh!